I'm showing signs of wearing out. I look haggard, I've lost a step and I would rather sleep in. All signs that another long season is coming to an end. There will be no more slaving away into the wee hours tying eggs, getting three to four hours of sleep, fishing in freezing weather and making the drive to the far ends of the Alley. Even though it's almost the end of April, I always get that nagging feeling of should I go just one more time? After all I have all summer to rest right? The freezer looks more empty as I've used up all of my eggs. There's my "break glass in case of emergency" supply of eggs. These are for the early fall, just in case we get an early run in Pennsylvania. I dare not touch them. I have no desire to tie anymore eggs and I'm out of spawn sac netting. During the week, I've heard reports of fish far up the Grand, but the clock is ticking. Warmer temperatures have finally arrived and spring has exploded along the Alley. Most of the trees have sprouted their leaves. The forest floor is a blanket of green and flowers. As for the streams, most of them have become low, clear and very warm. 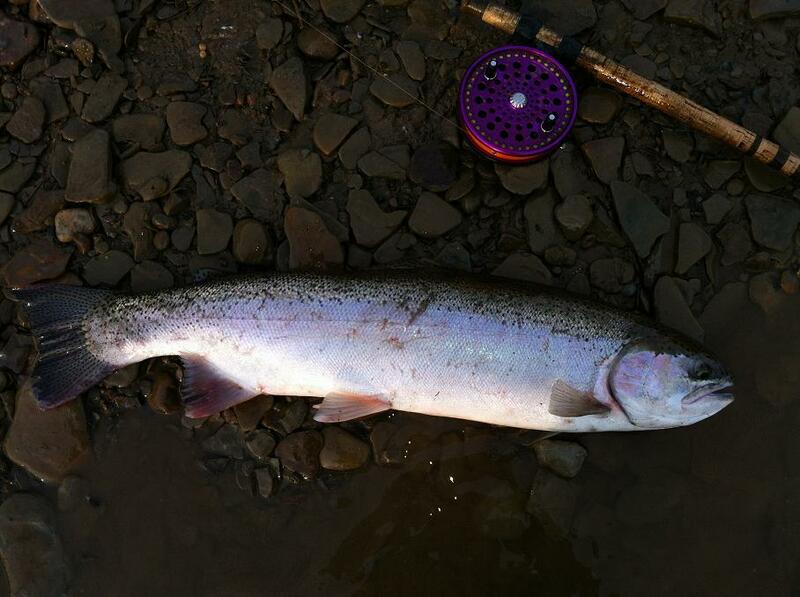 The water temperature has crept into the 60s and that's the upper threshold for these fish. There are still fish left but a lot of them are long gone far from the reach of me and land locked brothers. For the past couple of weeks, its been mostly dropbacks and I've had to deal with the plague of smolts. Despite their cartoon like appearance of huge eyes, round heads and small fins, they are cold blooded killers. They will attack anything that swims or move. That was evident as I watched schools of shiners skirt along the shoreline, trying to avoid detection. All morning I could hear them smacking the surface. I try to avoid them as I don't want to harm them. Ohio only stocks 400,000 of them into the Rocky, Vermilion, Chagrin, Grand and Conneaut. Out of the 400,000 of them, I would be surprised if 5% of them make through their first year. The lake is an unforgiving place for them. The last two trips were very different. Conneaut Creek had a decent number of fish. The runs and riffles had plenty of skippers willing to scrap it out. Even though the river was clear, they were perfectly hidden among the rocks. When they struck, a quick flash of silver revealed their presence. In most cases, they immediately leapt from the water. Leaping and thrashing about, I have a smile on my face. It makes those nights working at the table, tying sacs well after midnight and getting up at four in the morning worth it. I'll never get tired of it. I don't linger for very long, I have many spots to fish. I battled with several large spawned out hens. Looking to pack on the weight after a hard spawn, they are extremely aggressive. A heavier tippet insured the fight would be brief. The larger fish had to be revived and I felt confident that they would be fine. They slowly swim back to their lairs and by tomorrow they would more likely be gone. As the morning progressed and the sun bearing down, I started to feel parched as I covered a lot of water. Several holes and runs coughed up some fish. Once the sun was high, the bite shut off. I was working up a good sweat as I walked back. If this was March, the river would be a busy place. Today, I was the only person on this section. I finally reached the Jeep and quickly pulled out an ice cold beer. I was no hurry to get home as I sat on log and enjoyed my beverage and lunch. I sit back and soak up the sun. The rays feel refreshing and I want to nod off. I finish lunch and guzzle the rest of the beer. I undress and put on a pair of shorts. I chuckle as my legs are pasty white. The temperature is now in the 60s. I make my down several rural dirt roads with the windows rolled down. I drive by a couple of anglers and they wave. I give them a smile and wave back. I drive on to I-90 west. I looked in the rear view mirror and I won't return to Conneaut until September, I felt depressed. The Grand would be my final trip, it seems to be that way year after year. I arrived at the river and it was moving at a pedestrian flow. I greeted by numerous bank swallows catching insects emerging from the water. High above several turkey vultures soared taking in the warm early morning breeze. The surrounding woods were full of bird songs. 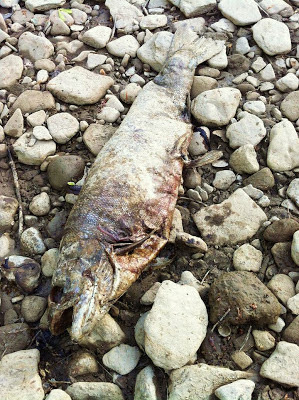 I walked along the river and came upon a dead steelhead. It was a fairly large hen and its rotting corpse had attracted flies. The body looked robust and there was no wearing on the fins. The fish was fairly large probably over 30" and about 12 pounds. Spring is the time of birth for many and sadly the death for others. The rigors of spawning is a very stressful event. For the females, the constant excavation of gravel, releasing eggs and fighting the current. For the males, expending energy in fighting for the sole right of inseminating the female's eggs. I suspected the fish was overplayed and not properly revived. The smell was overwhelming and I continued to the head of the pool. I fished a favorite spot for spawned out fish not far from a prime spawning area. Farther up on the other side, there was a scattering of anglers looking to see if there are any last minute spawners. I was pretty well out of eggs so I had to resort to minnows. The sun slowly crept above the trees and a warm wind blew from the south. The high for the day would be in the 70s with winds gusting by late morning. The window was shutting quickly. It was a far cry from a month ago when the trees were grey and lifeless. We were still dressed for winter and dreaming of warmer weather. I started to work the bubble line and it was an uneventful hour as I worked the entire pool. 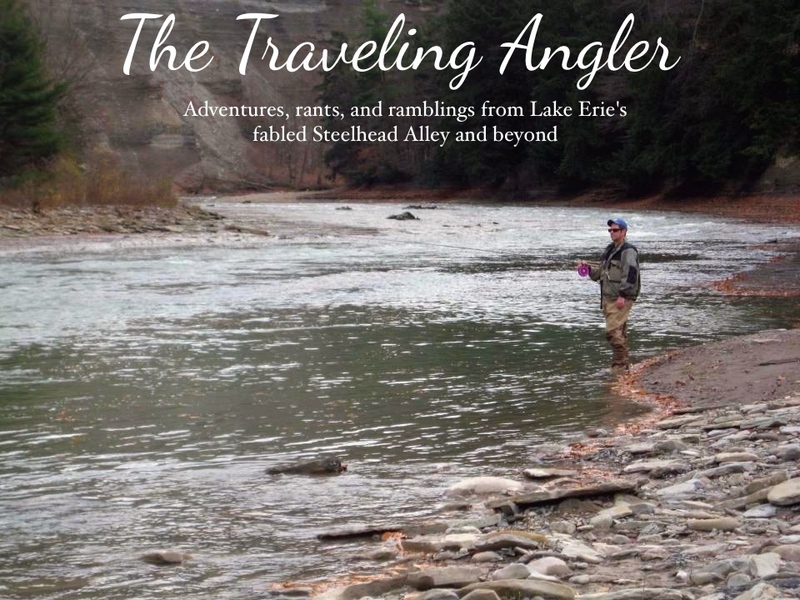 The odd slap of water from either a bass or steelhead, broke the monotony. I watched the float move along and it dipped slightly. Nothing hard and it almost seemed liked I bottomed out. I yanked and felt the rod throb. The fish darted about but it was very quick battle. It was a spawned out male and he sported numerous wounds through out his body. Bite marks, ragged fins and his colors were fading. I grabbed his tail and moved him back and forth. At first he didn't flinch or react. The stress of spawning and warm water also didn't help. Gradually the fish reacted and I gently released it. The male slowly swan off into the murky depths. It ended up being the last fish of the season. I drove to another spot further down river. Driving along I looked down at the river and didn't see one angler fishing several popular spots. I parked along the road beside another car. The wind was gusting harder and the sun was creeping higher. I get to the river and I see two anglers above looked in vain for any fish on gravel. I watch them move up and down, scanning the water for any signs of activity. I fish the head of a long sweeping pool. I look down and I see a large number of emerald shiners swimming along. They swim close to me, thinking I might offer them protection. There is a sense of purpose in their movement. Because of the sheer number of shiners, I was hoping some fish would be lying in wait for one to stray from the school. I worked the pool for about an hour and nothing.